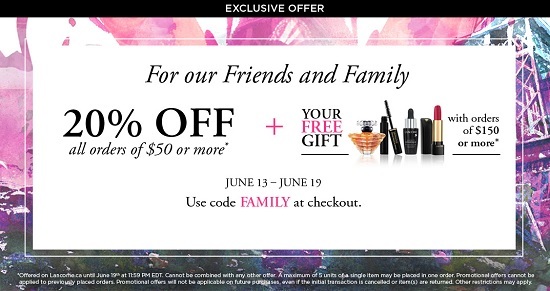 ou have an unique chance to save money during Friends & Family Sale at Lancome Paris Canada online. Get 20% discount on your online purchase of $50 or more. Plus, get your free gift with online orders of $150 or more! To get this amazing offer use promo code FAMILY at checkout. Official source of the information is Lancome Paris Canada. For more information about the promotion visit Lancome Paris Canada online. Offer expires on Sunday, June 19, 2016.